Here is a cool photo scanned by Uffe for me to share with you guys. 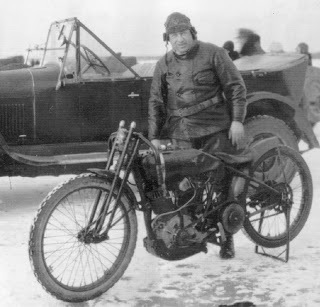 The guy in the picture is Ivar Liljekvist aka "kjøtbullen" (the meatball), one of the three big Harley racers in Sweden during the twenties. Ivar was one of the lucky three to get a Harley Two cam racer imported to Sweden by Lindblad`s in Stockholm. The other two where Master Erik Westerberg whom we know from previous posts on this blog, the third went to the Torell brothers in Stockholm. Two of those machines are still counted for, Master Eriks tough have dissapeared in the time passed. Personally I find there must have been at least four two cam racers in Sweden as Master Erik is seen operating two different bikes in pictures I`ve got. I`m working on a Master Erik compilation, lets see if that ever get done. Ivar "kjøttbullen" ready for some ice racing.